Croatia’s Homeland War consequences are still unsettling – a lot. The frequent commemorations at graves of victims or massacre sites of Serb aggression against Croatia convey a clear message of permanent expressions of profound, prolonged and intense grief of a nation, still after 26 years, crying for justice. The country’s pivotal operations, including the diplomatic core, are riddled with communist mindset unwilling to surrender to Croatia’s 1990’s original national creed of independence and full democracy away from communist Yugoslavia. The Serb aggressor has not in meaningful and lasting terms answered for the responsibility of aggression and hatred waged against a nation that chose to secede from communist Yugoslavia. This week of 18th November 2017 marks 26 years from the fall of Vukovar and massacres and ethnic cleansing of Croats and other non-Serbs from their homes; it marks also the massacres of Croats in Skabrnje; it marks also the amazing love for freedom and the multitudes of Croatian victims who perished in the early 1990’s defending its resolve to secede from communist Yugoslavia, resist a Greater Serbia expansion, and build a nation of freedom and democracy. Not a week passes in Croatia, it seems, that we don’t come across a marking of anniversaries of terror waged against the Croatian freedom fighters, whether that be the scaffolds, the mass graves from the 1990’s Homeland War or those of communist Yugoslavia crimes. Intense grieving for the victims never seems to subside; intense anger at the lack of justice for the victims is ever-present, intense need to justify (because others/pro-communists have wrongfully embarked upon criminalising it) defending Croatia from aggression in the 1990’s Homeland War that was – unquestionably – just. A nation arrested in grief unable to truly and fully move forward, channelling one into thinking and worrying as how all this will manifest in future generations. As things stand now the foreseeable future in Croatia is unlikely to bring any significant reprieve from the state of prolonged grief and confusion when it comes to lack of justice for the victims of the Homeland War. Year in and year out the status remains the same, some courageous political leaders and citizens speak the same: we need justice for the victims. Instead of pointing the finger in Serbia’s direction, for guilt and war damages compensation to Croatia, president of Croatia Kolinda Grabar Kitarovic decided in Vukovar or Saturday 18 November upon a populist statement that may appease emotions of the grieving Croats but shows absolutely nothing in the way of a future where intense grief would be requited by acts (instead of hope) of justice for the victims and country, giving way to building a better future where assertive emancipation of the nation’s original goals of democracy (severed fully from communism and communist mindset influencing the governance of the country) and prosperity. We hear every year, year after year, how Serbia needs to come clean regarding the missing in Croatia from its war of aggression against Croatia. “A lot of water will flow in the Dunav river before Croatia and Serbia become friendly states, but that doesn’t mean we cannot talk to them, our responsibility is to talk and solve the open questions such about those that are still missing that is a humanitarian question, which we have to solve as soon as possible, ” Grabar Kitarovic said. Tracking her and her dimplomacy’s relations with Serbia one couldn’t possibly see any genuine intention on her part as far as the connotations of this statement are concerned. We’ve heard it all before – for at least 20 years in fact. One would expect that to truly insist on justice, to truly insist upon solving the issue of the still missing, after 26 years, Croatia’s leaders would cease employing the diplomatic staff that have obviously not been doing a good job at moving beyond the impasse with Serbia on the issue of the missing. Instead of intent to continue talks with Serbia on this and similar issues president Grabar-Kitarovic would have convinced us better of the genuineness in her efforts to resolve the question of the missing with Serbia were she announcing in Vukovar the blatantly clear picture that Croatia’s diplomatic core needs a severe shake up. A shake-up which would sift out the pro-communist Yugoslavia, the former communist operatives and bring in fresh untainted by communism staff who might do a better job than their predecessors when it comes to diplomacy with a country that was also a member state of communist Yugoslavia but which did not want a break-up of Yugoslavia. Friendship per se has nothing to do with diplomacy when it comes to resolving critical issues that are important to the soothing of grief for victims of war of aggression prevalent in ones nation (Croatia). Business is business and, at that, friendships and any emotional or politically sensitive ties due to previous coexistence under the Yugoslav flag should be closely scrutinized, for it is these that interfere with objective justice. Croatia’s diplomatic core is riddled with former communist Yugoslavia operatives and it’s a fool’s paradise to think things can change regarding the missing while they go about playing the diplomatic game with Serbia for the interests of Croatia and Croatian people. “I think we should be restoring people’s lives more than some monuments, that people have a job, have a good time and that they don’t leave this town,” he said. For that to occur it is essential to recognise that, in aid of maintaining the destructive notion that communism and Yugoslavia were well-functioning platforms for people to live under, things of national importance for Croatia have become warped and distorted. The relationship that normally exists between national creed/orthodoxy and revisionism in historical writing as well as living itself has been reversed in Croatia. Specifically, in the case of Croatia, the national creed of righteousness of the fight for freedom only lived a relatively short time without disruptions before the former communists began with revisionist injections, claiming that the fight for freedom is to be criminalized while permitting constant claims how communist Yugoslavia was a great place to live in. It’s usually the case that the national creed precedes revisionism in historical writings: the first historians to write about great events generally accept official explanations for them – not in Croatia, not with so many former communists who didn’t want an independent Croatia in the first place. The overwhelming majority of citizens (94% of voters) voted to secede from communist Yugoslavia and defend that decision and belief with bare life defined Croatia’s national creed regarding the 1990’s Homeland War. The righteousness of that national creed moved the nation in 1990 with its diaspora to the robes of David against the Goliath (communist Yugoslavia led by Serbia and its determination for a Greater Serbia to be created via brutal aggression against Croatia and Bosnia and Herzegovina in particular). This was not at all an easy task, particularly given the fact that a great many of Croatian powerful communists acted against the very idea, let alone emancipation, of an independent Croatia, away from communism. Restoring people’s lives after a major war requires a national consensus on moral judgment for the war. It requires an affirmation on the national level of the righteousness of its national creed that catapulted it to today. Croatia, today, suffers a disturbing and disquieting dichotomy when it comes to the assertion of righteousness of moral judgment of its defence efforts against Serb and Yugoslav Army aggression in the 1990’s. Croatia must reverse the relationship between national creed and revisionism. With the passage of time and the coming into power of former communists in Croatia (emboldened by foreign biased powers) and the lack of lustration with view to enabling Croatia to move forward into a functioning democracy do we end up with palpable skepticism in the Croatian society regarding the Homeland War. 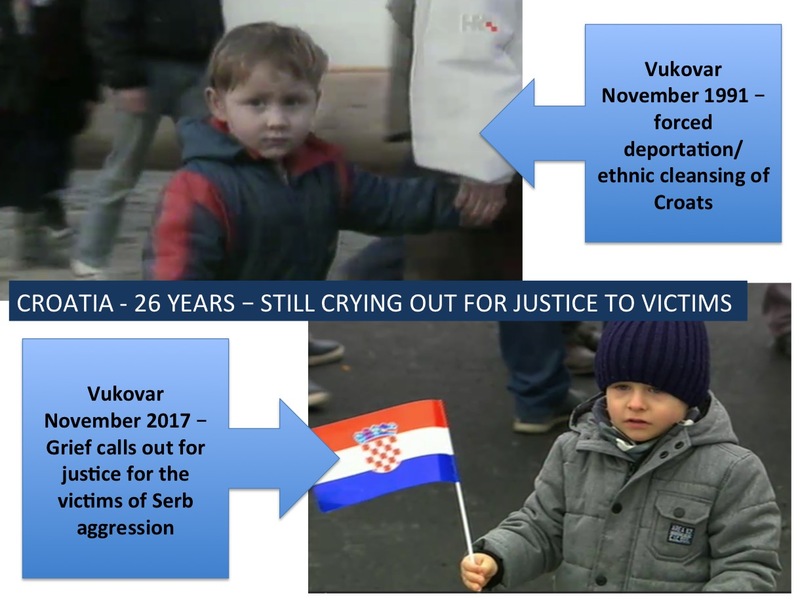 Croatian defenders, victims and Croatia’s status as victim-nation become lost – fretful for due recognition and justice. Its goals of freedom and democracy become bastardised as the Homeland War is shown by former communist leaders and notables as a criminalised venture, the push to equate the victim with the aggressor creating confusion, anger and helplessness for a nation largely arrested in prolonged grief due to lack of justice for victims of the war of aggression. The fight against communism in Croatia constantly being devalued and made to appear irrelevant and yet it was crucial for the nation voting to secede from communist Yugoslavia. Lustration would indeed put a significant stop to the communist revisionists of Croatia’s Homeland War – the equating of victim with the aggressor would experience the deserved quashing blow. Croatia’s communists never wanted an independent Croatia and all the revisionism regarding its war of defence, all half-baked attempts to influence the delivery of justice to the victims, have a great deal to do with that fact. The task for Croatia’s leaders must become one of insisting in unison that the Homeland War was necessary for precisely the reasons that the Croatian people and leaders at the time said it was: to preserve the credibility of people’s wishes to secede from Yugoslavia, because of which they had no choice but to fight the war in order to defend the nation and its people. To achieve that unison, lustration is absolutely necessary. Croatia achieved a military victory over Serb and communist Yugoslavia Army aggressor. The persisting efforts to equate the victim (Croatia) with the aggressor (Serbia) pretty much have the effect of minimising or even belittling the significance of that military victory, giving way to controversies that should not be. Giving way to unrelenting and intense grief for the victims-without-justice across the nation. If, as a nation, Croatia reflected seriously on the journey from independence through the lack of full emancipation of the goals set for that independence, we would have to acknowledge that the threat to freedom and democracy through continuing enslavement of the nation by communist mindset is something that is arresting progress and keeping the nation in a prolonged, constant state of grief. As long as there are present systems and structures which deny citizens of Croatian the opportunities and the judicial system commensurate with a full democracy (away from communist come socialist bureaucracy), social justice free from corruption, rights, and respect, emancipation of its 1990/1991 original goals remains an ideal and communism or its off-cuts will continue retarding the glory due for Croatia’s independence. You know Ina.. I do not know how such grief will ever be overcome.. For had I been there I doubt I could ever get over what happened.. It was hard enough learning of it, and seeing it from the perspective of what if it happened in our towns within our communities.. I remember it well.. So I just hope that we Learn from History.. though I doubt we ever will. Haven’t we seen this act before…for the last 26 years? What has substantively changed? I do not blame the Serbs for one thing ! Croatia’s lack of action to obtain justice. The blame lays at the feet of Croatian politicians and the public for not forcing this issue. Why are we crying, winging and not acting? This inaction illustrates something far worse in terms of Croatia’s leadership and who has real power within the country. I am saddened at trying to hide the truths. I am sure had I lived in your shoes I would be depressed at the slowness of the responses. . . Sue made a good comment about this same response. Hugs to you and yours and hope things finally get recognized for the unfairness and inhumanity which really happened! Ina: You and the family, have a Merry Christmas. Thank you. I will be invaded by the grandchildren. Grandpa will be knocked out and tired, early.